The Voice Kids is getting more and more exciting as the number of participants has increased compared with the blind audition for the two consecutive episodes of The Voice Kids Philippines dated May 24 and 25 . The show aims to give opportunity to kids who are talented but lack exposure. Update 1: Blind Audition dated May 24 and 25, 2014 summary here. 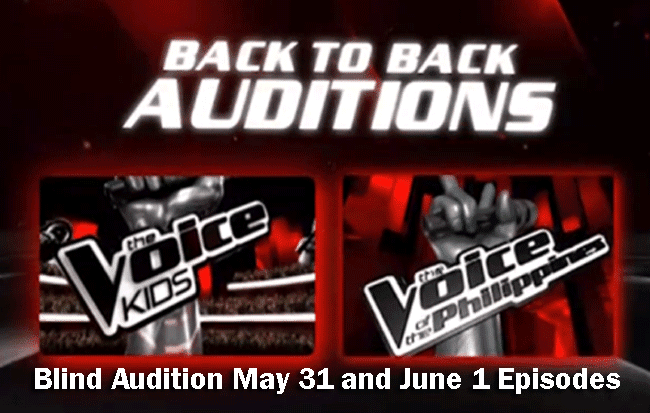 Update 2: The Voice Kids Blind Audition May 31 and June 1 Episodes here. Update 3: The Voice Kids Episode 5 June 7, 2014 here. Update 4:The Voice Kids Episode 6 June 8, 2014 here. Update 5:The Voice Kids Episode 7 June 14, 2014. Update 6:The Voice Kids June 15, 2014. Angelico Claridad – Angelico is an 8-year-old kid from Bacolod City who sang Bee Gees hit “Too Much Heaven.” His performance made the three coaches turn their chairs. Julienne Echavez – This talented 11-year-old kid from Las Piñas City sang Adam Sandler’s “Grow Old with You.” This made coach Bamboo turn his chair. Winston Cabilles – Winston came from Naga, Cebu and is 11 years old. He sang “Dance with My Father” and coach Lea turned her chair. Gab Gomez – Gab is a 13-year-old kid from Quezon City who sang “Ako Na Lang.” Coach Sarah got him. Earl Consolacion – Earl’s hometown is Negros Occidental and he is 12 years old. He sang “Lipad ng Pangarap” that made coach Sarah turn her chair. Camille Santos – Camille is from Greenhills, San Juan City. She is 10 years old and she sang “Maybe” that made coach Lea turn her chair. Arianna Ocampo – Arianna is a 13-year-old kid from Las Piñas City. She sang “Tattooed Heart” that made the three coaches turn their chairs. In the end, coach Bamboo got her. Karla Cruz – Karla sang “Titanium” that made coach Lea turn her chair. She is an 8-year-old kid from Taytay, Rizal. Rommel Bautista – Rommel is 13 years old from Tondo, Manila. He sang “Ako’y Sayo, Ika’y Akin” that made coach Bamboo turn his chair. Twizzle Dizon – Twizzle is 14 years of age from Koronadal City. She sang “Gising Na Kaibigan Ko” that made coach Sarah turn her chair. Darren Espanto – Darren sang Domino that made two coaches, Bamboo and Sarah turn their seats. In the end, it was Sarah whom he went to. Other kids who were not able to make it are Czexyle Portuza, Isha, LJ, Richell, Shannon and Alriz. The May 31 and June 1 episodes of The Voice Kids are the episodes 3 and 4 of the said reality singing contest. We will surely get to know the kids who entered the circle of Lea, Bamboo and Sarah after the training for they will surely compete and one of them will bring home the title.